Lives are more than stories, but sometimes the story of a life can be incredibly powerful. The ability to dream, to overcome and to tell our stories is only possible because of the freedoms we have in the United States. We are able to inspire others with our own stories through this freedom gained by the blood, sweat and tears of our military forces and those giving themselves before the country they love. The story of a life is a way to give the inspiration of a veteran’s tale of personal victory and his experience protecting our freedoms. Zachary Milo Wolf is a veteran whose life is a valuable gift of triumph over trial. His return to school, his struggle and victory over alcohol and his service in the military have all crafted a story that inspires strength when conquering odds from a seemingly inescapable hole. Zachary is a nontraditional student at OSU and a junior majoring in kinesiology. His career goal is to receive a master’s in education to become a health and physical education teacher, and to coach sports as well. Zachary served in the United States Marine Corps for approximately five years. Beaver’s Digest had the opportunity to sit down with Zachary for an overview of his life from graduating high school until present–about a twelve-year period–to share the incredible story of his life with others. In 2004, Zachary graduated from high school in his hometown of Klamath Falls, Oregon and attended Klamath Community College for one term. He reflected on his lack of maturity at the time and his inability to focus. “I wish I hadn’t wasted that semester of money,” Zachary says. With a strong interest in athletics during high school, Zachary grew up expecting to play football at a junior college, but when his dream fell through, he found himself in college without ambition. He dropped out following the term and returned to construction, a job he worked during high school. The economic crash in 2008 resulted in Zachary losing his job and struggling to find a next step. He had several friends returning from serving in the Marine Corps in Iraq and while grasping for a new opportunity, his friends suggested he look into joining the military. They suggested the option because of his enjoyment of the organization and discipline that comes with high school sports. He decided to join and swore in on December 2008, entering boot camp in April 2009 at Marine Corps Recruit Depot, San Diego. In high school, Zachary began struggling with alcohol. Before leaving for boot camp, he was the caregiver for a close family friend–nearly an aunt to him–who was battling both brain and lung cancer. While in boot camp, she suffered a stroke. Following graduation at the Marine Corps Recruit Depot, Zachary went home for a week and was able to visit with her. He remembers her struggle with movement and the increased hardships she was battling; he knew that visit would be their goodbye. When she passed away five weeks into his time at the school of infantry, he returned to alcohol after previously being 12 months sober. In the Marine Corps, Zachary chose the position of a machine gunner and was stationed at Camp Pendleton in San Diego. Zachary had two deployments, one in Afghanistan from October 2010 to May 2011 and a second deployment to Okinawa, Japan from June 2012 to December 2012. Alcoholism continued to shadow him through his first and second deployments. “I think some of that was coming home from my first deployment. I didn’t cope well with that….At the beginning of coming home from that, I don’t think I took the right procedures to be in a good place emotionally,” he says. After about a year of working as an instructor, Zachary left the Marines, noting the role alcoholism played. He was in a difficult marriage at the time, resulting in more conflict during this phase of his life. He and his first wife had met a few months before his deployment and their relationship moved in fast forward. Nearly right after returning from deployment, the couple married and had a daughter together. Together they drank regularly and would often argue in result. Zachary mentioned the toxic situation, even culminating to unhealthy interactions between him and his wife. The pair went through a brief relief of this battle for about six months after their daughter’s birth, but soon fell back into the harmful cycle. He notes the guilt he still feels about the situation, but also the importance of needing to look towards the future. “I can’t change the past. All I can do is live in the present and change my future, and I think that’s the path I’ve decided to take,” he says. Zachary’s young home life has played a key role in his struggles. His father was an alcoholic, his mother was a drug addict–though clean for several decades now–and his grandfather was killed in a drunk driving accident. Zachary’s father was not very involved in his life, causing him to want to be a better father to his daughter, Hailey, who turned four in February. “I want to be a good father,” he says, “My real father wasn’t the best when I was a kid, he wasn’t really around. I don’t want that. I think it’s lessons learned…I don’t want that for my daughter. I always want to be there for her. I always want to be a positive influence in her life.” However, Zachary only has visitation rights as of now; his ex-wife has full custody of their daughter. He understands that this is a consequence of previous behaviors, due to alcohol. However, Zachary is still determined to make strides to become more involved in his daughter’s life. With a major in kinesiology, Zachary had the choice of attending Oregon State University or Western Oregon University. He visited OSU four times before making his decision. “I liked the environment, I loved the campus. I think it’s beautiful,” he says. At the end of spring term in 2015, he was accepted and planned to transfer to OSU. He was in a relationship with a woman living roughly 75 miles away from him at the time and becoming somewhat serious, the two decided to move in together. The couple moved to Corvallis in September 2015. The weekend they were moving up, Zachary was in a motorcycle accident that resulted in a fractured kneecap. This began to cause conflict physically and paired with the difficulty of transitioning from a community college to a university, it caused even more stress. Again, the shadow of alcohol began to rise. In November 2015, he met the breaking point with an angry outburst, resulting in his girlfriend–who had recently become his fiancé–leaving him. The next couple of months went by slowly. This was the turning point for Zachary. He was forced to come face to face with the alcoholism that ad followed him for more than a decade. He could choose alcohol or the girl he hoped to marry. Zachary took a look in the mirror and asked himself if he was where he wanted to be. He sat down and made a list of the positives and negatives that alcohol had brought into his life, and quickly realized the negative after negative the substance fueled. The couple took it step-by-step as he made changes. He completely quit drinking. He previously used smokeless tobacco, which he completely quit as well. Today Zachary is now 17 months sober. The two moved back in together in February 2016 and bought a house the following April, but Zachary’s strength was still being tested. He was placed on academic suspension from OSU at the end of spring term in 2016 as both a result of the previous impact alcohol had on his schooling and from spreading himself too thin in activities outside of school. “I was crushed,” he says, “I remember, I had my daughter at the time and I was at my mother’s house. I was giving her a bath and it was a very sad time for me. I remember crying, and had the shower curtain closed so my daughter couldn’t see me crying. I remember thinking I’d just failed at something, and I hadn’t failed in a long time in my life.” Once again, instead of letting the towering odds conquer him, he petitioned the suspension and was readmitted into OSU for the 2016 fall term. Being a nontraditional student and a veteran gives Zachary a unique perspective on his educational experience. He is the first to attend college from his immediate family. He notes the work ethic and moral compass instilled in him by his stepfather, coaches and teachers as a major force in his return to college. He has difficulties connecting with other students due to the age gap between them, which often ranges from 8 to 12 years. Yet this provides him with the opportunity to connect with professors on a different level due to the mutual understanding of certain life experiences. 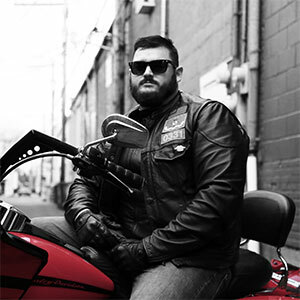 Zachary expressed a desire to partner with fellow veterans who are also struggling to find a way out of the seemingly endless battle, as well as a desire to build relationships with them. “I think the veteran’s lounge is an excellent location for veterans,” Zachary says. He also has an innate passion for “benefiting people.” He wants to share and learn from others, to develop these relationships with people. Lives are more than stories, but sometimes the story of a life is more inspirational than what meets the eye. Conquering alcoholism, defeating the odds, serving his country and the brightness of his future all show the inspiration Zachary Milo Wolf’s story holds. He grapples each term and continues his schooling with the hope of teaching students about both health and the power of life. Every person battles inner demons, every person has a bottomless hole they cannot seem to fill. With strength and courage, we all simply have to begin to dig steps out of our holes to prove wrong every person who claims we will fail. If someone doesn’t believe in us, our own strength will inevitably convince the naysayers of our courage. We all have our own holes. We must only begin with a moment of self-evaluation, choosing to construct our steps to the freedom above and beyond the hole. This story was originally published in Beaver’s Digest, Volume 3, Issue 2.